In these stories from the early 1960s, readers learned the secret origin of Green Lantern's oath, faced the judgment of his fellow Green Lanterns, battles the evil of the sound-stealing Sonar and master of magnetism Dr. Polaris, and meets fellow hero the Flash. 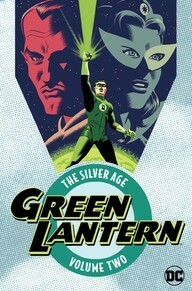 Plus, will former One of DC's greatest superheroes, Green Lantern, stars in this new trade paperback collection. In these stories from the early 1960s, readers learned the secret origin of Green Lantern's oath, faced the judgment of his fellow Green Lanterns, battles the evil of the sound-stealing Sonar and master of magnetism Dr. Polaris, and meets fellow hero the Flash. Plus, will former Green Lantern Sinestro be named the most evil man on Qward? This second Green Lantern volume doesn’t expand the world as much as the first, but it’s still enjoyable. I like the “Hal in space” stories more than “Hal on Earth” ones. We see Sinestro a few times, plus Star Sapphire, Hector Hammond, and Dr. Polaris. The Flash team-ups were fun - look here for the beginning of the Hal and Barry bromance. My favorite story has to be “The Strange Trial of Green Lantern,” which sees every Lantern working together. Many references to Hal's Eskimo companion "Pieface." (Real name: Thomas Kalmaku.) I don't understand the nickname "Pieface" and I don't really think I want to. There's a lot of Carol Ferris opining over whether she loves Hal Jordan or Green Lantern more. Which these days, is weird. And, in reading these stories (and the ones he penned for The Flash), there's a very distinctive "pulp sci-fi" feel to John Broome's stories. Sound Waves! Mutated Monsters! Cosmo-radiation! Planets with oppressed savages! Magnetism! It's all very 60's when anything was possible through Science! Silver Age Green Lantern has many of the same flaws of many comics from the era, but still makes for a fun afternoon read.